Yeah, 3d modeled hands tend to look odd from behind, I will try rearrangeing the hand and finger position to make it more apparent as to which side it is on. As for the rocket launcher, the sprite from the original graphics was almost entirely hand drawn, thus making a perfect re-creation all but impossible, my attempts to make a curvy one failed so badly that I just made it strait. Fair enough. Anything on my rocket launcher not reaching the edge? I asked if screen size was the same as aspect ratio but haven't heard back. Also, any thoughts on my request for an overhaul of the pistol? Edit: A while later, and I decided to check the rocket with several screen sizes, and it seems to only work with 1680x1050. Most of my suggestions for how to improve a game boil down to "It should be more like Halo." I will see what I can do about a new pistol, however it may take a while. Oh, it seems that I messed up the horizontal offset for the rocket image, Here is a new script (just drag it in and replace the old one) If it still has the gap, then it will need more moving. Awright, rocket launcher matches up now. Thanks. An idea struck me while I was playing this morning. Now, let me preface this by saying that the assault rifle is already awesome, so if you don't have the time or just don't feel like doing this it wouldn't be a big deal at all. So, you mentioned that you're willing to deviate from the original sprites. 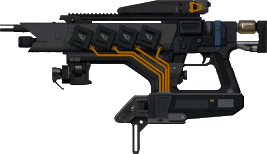 Maybe the AR would look cooler if we were holding it like you do in Halo? Up a bit more, and to the side. That way we could see some of the side. It came to me when I was looking at one lying on the ground. You did an awesome job with those, and I was thinking it's a shame that most of the time we're only looking at the top. Game automatically quits for me whenever reloading with the AR. Are you using the new script? And is it just the AR that does it? Does the error occur sometime in the middle of the reload, or the moment it starts playing? I had a few issues with resources not loading right, but I think it only happened with the 3d models and their textures. Other then that, I have no idea what could cause it, as my brother and I thoroughly tested everything on every computer we could get our hands on. Does anyone else have any ideas? I just saw the screenshot on Simplici7y. I really like that the weapon on the ground has a shadow under it. To my knowledge, no one's bothered with that little touch before. It looks very natural. Did you use a different model for the Zeus on the ground and in the hand? Yes, the weapon in hand model wasn't made to be viewed from all angles, and the model that I made later worked pretty well as an Item, although it is rather inconsistent. That's what I thought, could you maybe post a pic of the on the ground model from the angle you would see it in your hand? It's a 3D model, right? So you can just rotate it? I suspect it would look better than the current one. I have been distacted as of late by the end of school year finals and such, this project is kinda on hold for now. General Tacticus wrote: Are you using the new script? And is it just the AR that does it? I'm really sorry about that. I tried to delete that post right after posting, but I guess I didn't do it right. The problem I was having seems to have been caused by a conflicting plugin. (Press Retry to debug the application - JIT must be enabled)"
Last edited by Zetren on Mar 8th '16, 18:08, edited 1 time in total. Considering the dates of all the other comments, I think it's safe to assume this thread's pretty much dead. No offence intended, but I doubt you'll get a response from the op. Indeed, twas merely for posterity.